Fighting/writing malware is very much a cat and mouse game. One of several techniques used by Anti-Virus/EDR solutions is to detonate payloads in a sandbox and watch what happens. To combat this, malware writers (and pentesters) have been including checks in their payloads to identify when running in a sandbox to evade detection. However, these evasion techniques themselves are often being caught. So, to that end, I wondered if there might be a way to enumerate what anti-sandboxing checks are stealthier than others. 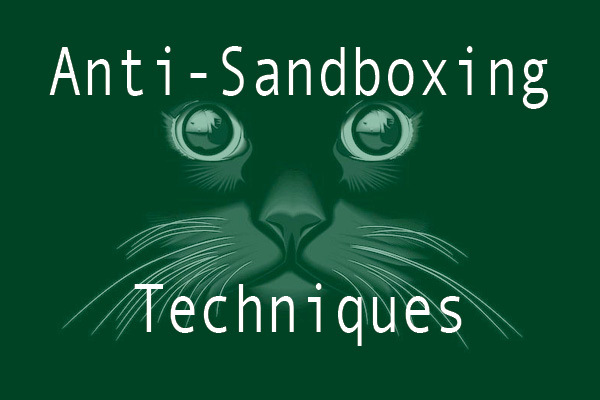 Not all anti-sandboxing techniques are the same. For example, one technique, wherein the payload counts the number of CPU’s and only detonates if there are more than 3, can be coded in several different ways. For these tests, I went with the most basic approach. If a technique is caught, then we know which approach needs more investigation, and which should simply be avoided altogether. Security solutions on VirusTotal and MetaDefender are configured by the vendor and may be configured differently in your environment. There are plenty of anti-sandboxing techniques to use/choose from, I just selected ten out of ease. Rules and definitions are updated constantly, therefore these results might vary a month from now. All testing was performed in June 2018. 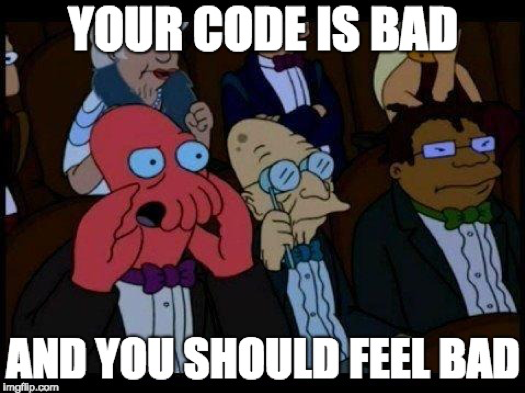 My coding skills are weak and mostly consist of stack overflow and duct tape. 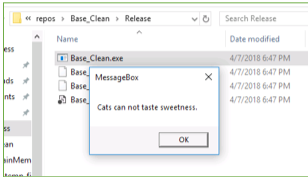 For this step, I created a simple program, which when executed displays a random fact about cats. I submitted the baseline app to Virus Total and surprisingly 5 out of 67 AV vendors think it’s malicious (or they just straight-up hate cats). Hybrid Analysis gives it a score of 36/100 and Meta Defender gives it a 2/31. While this is less than ideal for a simple harmless app, it does provide a baseline for our next steps. 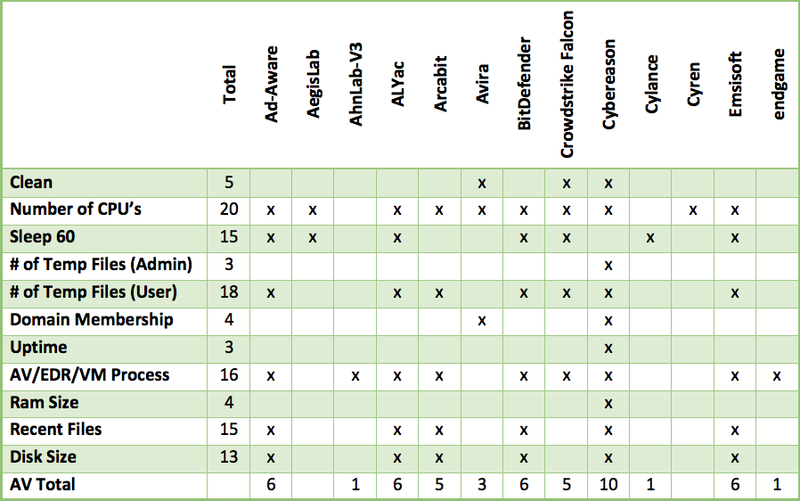 With each check, a separate executable was generated and submitted to Virus Total/Hybrid Analysis and MetaDefender. 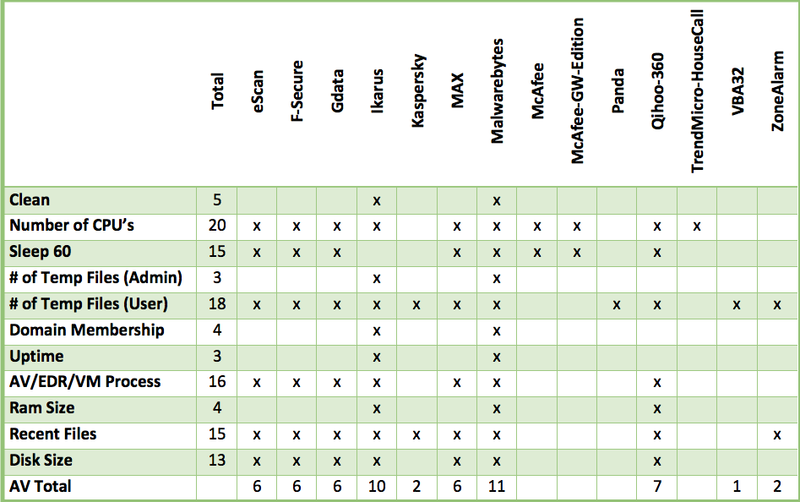 These sites were chosen as they provide a wide array of AV/EDR products to test against. This will check the number of processors on the system. If there are less than two processors, exit. Results: Virus Total (20/67), Hybrid Analysis (78/100), MetaDefender (5/31). The program will wait 60 seconds before continuing. Results: Virus Total (15/58), Hybrid Analysis (100/100), MetaDefender (4/31). This will check for the number of temporary files in a directory normally written to if the user has local administrative privileges. If the count is less than three, exit. Results: Virus Total (3/67), Hybrid Analysis (35/100), MetaDefender (1/31). 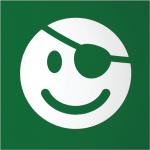 This will check for the number of temporary files in a directory normally written to if the user does not have local administrative privileges. If the count is less than three, exit. Results: Virus Total (18/68), Hybrid Analysis (79/100) and Metadefender (9/31). This will check to see if the host machine is a member of a domain. If it’s not a member, exit. Results: Virus Total (4/66), Hybrid Analysis (42/100) and Metadefender (2/31). Results: Virus Total (3/67), Hybrid Analysis (35/100) and Metadefender (1/31). This will search the current running list of processes. 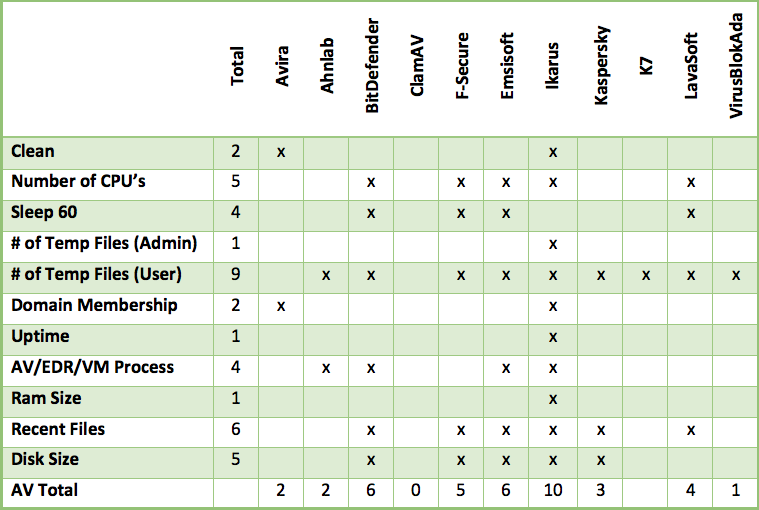 If any match our predefined list of known anti-virus vendors, exit. 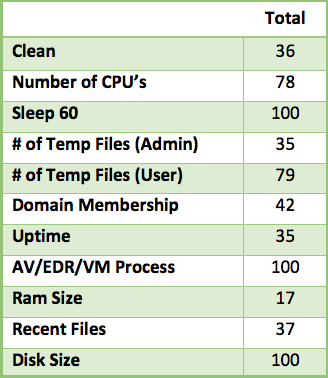 Results: Virus Total (16/67), Hybrid Analysis (100/100) and Metadefender (4/31). This will check to see the total amount of installed RAM on the system. If it’s less than four gigabytes, exit. Results: Virus Total (4/67), Hybrid Analysis (11/100) and Metadefender(1/31). This will check the total number of recent files under the current user’s home directory. If the total number is less than five, exit. Results: Virus Total (15/67), Hybrid Analysis (17/100) and Metadefender (6/31). This will check the total amount of disk space on the installed system. If it’s less than 60 Gigabytes, exit. // Someone is playing tricks. Or not enough privileges. Results: Virus Total (13/67), Hybrid Analysis (100/100) and Metadefender (5/31). First off, we can tell that there are many products out there that do a great job of detecting anti-sandbox techniques. Granted, many of these techniques on their own are not malicious, so every instance where our payload is flagged as being bad is really a false positive. That said, this information does allow us to narrow down on what techniques are, in their simplest form, effective in reducing detections. Using the information above, I can see that using sleep, AV/EDR process names and disk sizes by themselves will most likely get us flagged. 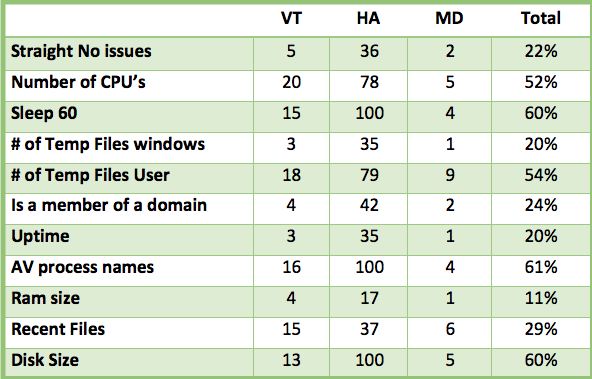 As an attacker, I could spend time focusing on reducing the detection rate there, but instead, why not focus on something like domain membership, Uptime, or Ram Size? If you’re interested in testing your own anti-sandbox techniques, I’d recommend checking out the examples at CheckPlease. With over a decade of industry experience, Hans Lakhan (@jarsnah12) has worked in both offensive and defensive roles. Before switching to red teaming, he spent 5 years working as a Technical Security Analyst for a Fortune 500 telecommunications company, specializing in networking, firewalls, vulnerability management, and VPNs.